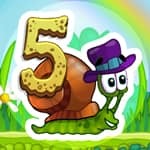 Help the snail named Bob to find his favorite in the game Snail Bob 5. However, he can not overcome all these difficulties of his own way, that’s why your help is needed! In addition to the main task, you can collect hidden secret stars.